Have Obama And Putin Agreed To Destroy NATO? Because it sure looks like it. I have written previously about our Manchurian president, whose policies seem to be tailored to drastically alter the trajectory of this country in a negative way, reducing American power and influence around the world and destroying our way of life which made this country great. Now I fear our dear leader has his eye on another prize, the downfall of the North Atlantic Treaty Alliance that has held the peace in Europe, if not globally, for sixty years. Russian President Vladimir Putin has been on record saying, “The breakup of the Soviet Union was the greatest geopolitical tragedy of the 20th century.” Now we see Russia , under Putin’s leadership, well on its way to reestablishing lost Soviet control of Russia’s border states. I have no doubt, if left unchecked under Putin’s direction, Russia will move to regain its dominance of Eastern Europe. Vladimir Putin would like nothing more than to destroy the alliance that won the Cold War against the Union of Soviet Socialist Republics. If you saw Dinesh D’Souza’s movie “2016: Obama’s America”, you will understand the thesis that Obama looks at the world from a different worldview. He sees America’s European colonialist roots as the problem in today’s society. Remember when he sent the bust of Winston Churchill, who was instrumental in defeating fascism, back to England? Obama does not have a Eurocentric view of the world; in fact, it’s quite the opposite. In Obama’s mind, white Europe is not something to be especially worried about. He’d much rather concentrate on redistributing wealth at home. So what if Putin wants to take a few former Soviet republics? It’s not something to spend political capital over, especially with opinion polls showing American’s fatigue of overseas adventures, the need for American presidential leadership notwithstanding. So now we hear rumors that the Kremlin is stirring up the same type of political unrest in Estonia, which has a forty percent Russian speaking population. Estonia also has an earned reputation for the rule of law and a free press, something Moscow has little tolerance for. 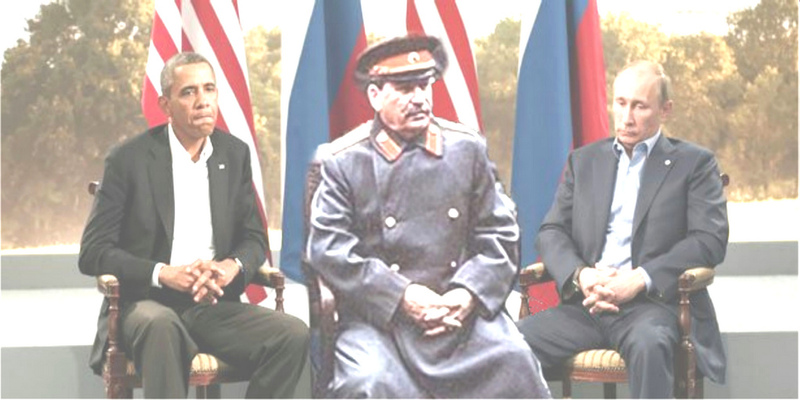 It’s the same old Soviet, or Nazi, playbook. Stir up a little civil war in a neighboring country, and then your military rides in to the rescue when one of the Russian-speaking population members gets shot as the local government tries to regain control. We’ve seen this movie before. Putin would like nothing more than to see Russian submarines again docked at the Paldiski shipyards. The small little problem is that Estonia is now a full fledged member of NATO. That means that Estonia can invoke Article Five of the Washington Treaty, which says that an attack against Estonia is an attack against all NATO countries. This scenario would require the United States to come to their aid with armed force if required. The question that Vladimir Putin must have already asked himself is, “Will the United States fulfill its obligation under this treaty if Russia looks to ‘protect’ the Russian speaking population of Estonia?” Unfortunately, I think Putin believes the answer to this question is a resounding no. So now the question becomes, is this the type of flexibility that Obama told Prime Minister Medvedev he would have after the 2012 election? Does Putin already know Obama will not deter him from attempting to annex Ukraine, Estonia, or other Eastern European countries? Obama has already allowed Putin to dictate outcomes against American interests during the Iran negotiations, the Syrian crisis, and elsewhere. Has a tacit agreement been made between Obama and Putin in the Baltics? If you really don’t care about the survival of NATO, what better way than to just let nature take its course and allow Putin to move west to the Near Abroad? One could even call the whole scenario Europe’s own fault for not spending for their own defense. Or one could call it karma for Europe’s history of enslaving its African neighbors for centuries. Whether this weakness shown by the Obama administration is intentional or not, it doesn’t matter; the consequences will be the same. For if Russia is allowed to penetrate NATO’s outer limits without severe military consequences, the entire premise of Article 5 will be shown to be a paper tiger, not worth the paper it is printed on; and the North Atlantic Treaty Organization will be destroyed. SEE ALSO: Date With Destiny: Is Independence for Eastern Ukraine a ‘Done Deal’? If there was ever an exhibit of just how low, evasive and putrid the US and EU political and media establishments have become in the 21st century, this is it. The political spin which sees the dead as collateral damage along the road to western policy attainment – is shameful. The A-Z fraud of the US-EU marionette coup de tat in Kiev, along with their cutting radical pragmatism and universal denial of any subversive methods used by the US State Department’s neocon operative Victoria Nuland – will be a black mark on the US international records for decades to come. As she and her colleagues undermine 70 years of progress in fighting political fascism in Europe, the rest of the Washington X-Box regime changers callously ignore any heinous crimes that run counter to President Obama’s thinly written speeches, or those of his the low-empathy surrogate Jay Carney. Theirs, along with John Kerry, Joe Biden, John McCain and Nuland’s mentor Hillary Clinton, typifies the culture of shallowness and moral relativism which has defined this US President, and the US government. And despite all that is wrong with the US involvement in the Ukraine, it is self-evident that Obama’s White House has OK’d the deployment of at least 400 Blackwater/Academi mercenaries troops in that country – with what other purpose than to intensify the violence in Eastern Ukraine? This was the Ukraine’s own “Waco Moment”. 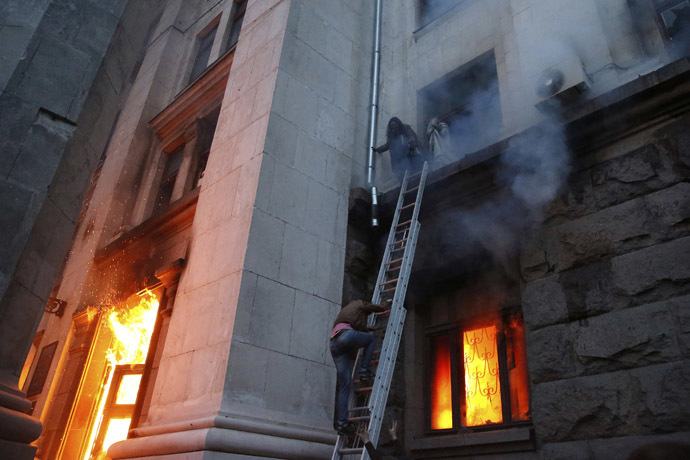 Did the ‘Janet Reno-style’ order to burn innocents alive in Odessa come from the CIA’s new operating base located on the top floor of the government security building in Kiev, or from closer to home? Odessa Atrocity Erupts in Peaceful City, And No One Wonders Why? Kiev supporters burn opponents alive in Odessa, police do nothing. The acting president of Ukraine, Oleksandr Turchynov told regional governors on May 1st that the Kiev interim government was “helpless” to re-establish central government control in eastern Ukraine, where anti-Kiev forces (pro-independence and/or pro-Russian) have taken control of numerous cities in a manner imitating the way the Kiev government itself seized power in February. “I will be frank. Today, security forces are unable to take the situation in the Donetsk and Luhansk regions quickly under control,” Turchynov said at the May Day meeting. He reported that numerous Ukrainian military and security personnel had defected to the rebels, taking their arms with them. With Kiev’s authority in doubt in much of eastern Ukraine, Turchynov said his government’s plan was to try to slow pro-Russian gains by concentrating on the defense of Kharkiv in the northeast and Odessa in the southwest. For months, Odessa (population about one million) had remained relatively peaceful despite turmoil in other parts of the country. Odessa was more disturbed by speculation than active demonstrations. The April 16 declaration of the “Odessa People’s Republic” turned out to be a hoax and European monitors reported that the city remained calm. On April 23 in Odessa, people from various sides, including supporters of Euromaidan (pro-Kiev) and supporters ofAntimaidan (pro-Russian culturally, but not always pro-separatist), agreed that the greatest threat to Ukraine was from abroad. They reportedly worked together to establish checkpoints around Odessa to defend against pro-Russian provocateurs. The day after acting president Turchynov spoke of being “helpless,” the Kiev government launched its largest military operation to date in eastern Ukraine, an action that is still causing casualties on both sides, as the fighting continues at a low intensity. On the same day, May 2, Odessa suffered more civilian deaths than any place in Ukraine since some 70 people died in Kiev in February, in the course of the bloody coup that brought the present government to power. “A pro-unity demonstration, which included nationalists and football fans, ran into a rally preaching greater autonomy for the regions. Gunfire was heard” as two rival rallies met, police having failed to draw them apart. Over 2,000 protesters pelted each other with Molotov cocktails and smoke grenades. Pavements were dismantled to get the stones for the fight, like it was done in Kiev during the Maidan protests. Local police reported that four people were killed in the stand-off, and at least one of them died due to a gun-shot wound. At least 37 received injuries in clashes”. Judging by some of the available video, most of the crowd was not involved in any violence. People by the hundreds mill about like a crowd at a carnival, wandering around an intersection where nothing appears to be happening, while a large cluster of people to one side looks down a street toward a sideshow, something billowing smoke out of sight of the camera. Even when there are explosions or when shots ring out, no one seems to react. The crowd is overwhelmingly male. A lone young woman with a camera seems unconcerned in the middle of the street. Some of the men are masked, or wearing uniforms of one sort or another; some wear helmets and quite a few carry sticks or clubs, and shields, but firearms are rarely shown. Only a few people have cameras visible. A group of ten or more pro-Kiev men hijack a fire truck, then sit on it without moving. A Molotov cocktail burns on an empty street. A long video compilation starts in bright daylight, showing police forming a line with their backs to one group of protestors as they face a sketchy barricade of lumber, ladders, a dumpster, panels of some sort, and other large detritus. Beyond this is another crowd in the distance. Some in the near crowd throw stones over the police in front of them, but it’s unlikely any can throw far enough to reach the other crowd. These police do nothing to intervene. Later there are some 30 police huddled together behind their shields as a handful of young men pelt them with rocks. In other shots there are men (not police) with handguns and automatic weapons. Later in the day, the pro-Kiev forces attack a large stone building, five stories tall, with a colonnaded front entrance that is barricaded by its defenders. The attackers dismantle and burn an encampment in front of the building, dismantling a speaker’s platform and towers for lights and sound equipment. This is Odessa’s Trade Unions House and it is under siege, surrounded by a scattered, bustling crowd of hundreds of mostly armed men. Some throw stones at the defenders. Shots are fired. Farther back are thin ranks of hundreds of onlookers, many passively taking pictures. It appears to be a scene of relentless, low-intensity but extreme vandalism. Trade Unions House in Odessa: Many were burned alive as police made no attempt to stop the carnage by pro-Kiev fascist mobs. Later, the barricade is gone and no defenders are visible in front of the building. 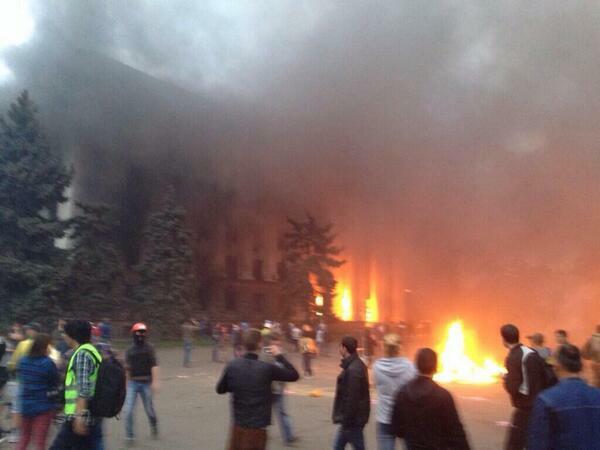 The pro-Kievattackers have set fire to perhaps a dozen tents in front of the building and they burn into the night. Flames twenty feet high engulf the entrance to the Trade Unions House. Intense flames rage inside the ground floor and thick, black smoke pours out of windows on several floors (it looks like a stairwell on fire). There are people inside the building, fifty reportedly trapped on the roof. In the twilight, police arrive quietly, in formation, without reaction from the crowd. The police don’t do much. Wounded or dead victims are dragged or wheeled about, or left lying on the pavement. No one fights any of the fires. There are more occasional shots or small explosions to which no one visibly reacts. There is no sign that people inside the building are fighting back. The crowd gets noisy when more than half a dozen people from inside the building appear along a narrow ledge, between smoking windows. Some of the onlookers have moved one of the light and sound towers next to the building, allowing people on the ledge to climb down the pipe framing, with police surrounding the base. In another tape, someone throws a Molotov cocktail that hits the side of the building and burns on a ledge. A heavyset man in a blue uniform shoots his pistol at the building. A man crouches on a ledge above the crowd as smoke and flames pour from a window to his right. Someone throws a Molotov cocktail that burns on the ledge on the other side of the window. Later the man is gone. If any of the dozens of men in uniform are police, they are doing nothing to control the crowd. A crawling, wounded man is kicked from behind. There are other wounded people, some getting medical attention (officially, more than 200 were wounded during the day). At one window of the Trade Unions House is the Ukrainian flag. Two people hang onto the outside of a window frame of a smoking third-floor window. At another window there are flames inside. People are leaning out of other third floor windows. Someone throws a Molotov cocktail at them, but misses. The crowd remains quiet, ignoring explosions. Drumming begins in the distance and lasts a few minutes. A rescue effort using ropes and a sound/light tower and a ladder takes almost half an hours, but frees several people from the third floor. The second floor continues to burn nearby, but another ladder allows a few more people to escape from a smoking window. A man in a white helmet climbs a ladder to a third floor window and leads more people down. Firefighters in white helmets have extinguished the blaze at the front door. There are still hundreds of people in front of the building, but they are quiet, and the tent fires have burned out. It is dark. What light there is comes mostly from flashing emergency vehicles. In the aftermath, inside the Trade Unions House , a 14-minute video travels with what appear to be police officers walking through a series of offices that have been trashed, but are not burned. The “officers” occasionally rummage through papers, but ignore the occasional, apparently lifeless body. Outside, in the dark, people are milling about, occasionally calling out, sometimes laughing, mostly quiet until a group starts to chant in the distance. This fragmentary and non-linear impression of events in Odessa is based predominantly on several hours of video for which there is no reliable verification (or discrediting). The cumulative effect of seeing many of the same moments from different angles lends credence to the reality of what is shown. Little if any of it could have been staged without great effort that surely someone would have noticed. It’s hard to find a credible and detailed account of that day’s events anywhere, never mind in mainstream media [the best I have seen so far are by RT (several) and the BBC on May 6]. că în Muntenegru plouă!!! DA! Plouă, senzațional! Și carosabilul e umed! Fantastic! !